There’s been a subtle shift in global money flows over the past couple of weeks. It started when the US Fed announced that it was winding up “Quantitative Easing”. Maybe we need to back track a bit here and explain a bit about what QE was and what it meant. After the sub-prime mortgage market collapsed in the US in 2008, the US economy went into a nose-dive. The Fed leaned hard on the monetary policy lever. They cut interest rates. And then again. And then again. But nothing worked and before long official interest rates had fallen to effectively zero. They had run out of ammo and now they needed to get creative. That’s when MacGyver took a couple of paper clips, some tin cans and a broken transistor radio and cobbled together Quantitative Easing. The short of it is, that the Fed was “easing” the quantity of money in the system. Yep. They were just printing money. At its peak, they were pumping $85 billion in the system every month! Over the past year or so, as more and more positive news has come out of the US (or there was a growing realisation that QE just wasn’t working – one or the other), the Fed has been gradually tapering QE back. Last week, it finished up altogether. It was an interesting experiment, and I don’t think anyone quite knows what to make of the results. The optimists might claim that QE stopped America sinking further into the mire. Maybe, but it’s hard to know. Critics would argue that if you’re going to spend $85 billion a month, you should expect a pretty big bang for you buck. There was no bang. Barely a pop. But that in itself is pretty surprising. Pretty much everyone – critics and proponents – thought that QE would be inflationary. That’s what normally happens when you print money. You have more money chasing the same amount of goods, and prices go up. Pretty much every other money-printing experiment in human history has gone this way (and usually ended in a massive ditch). But not in America. Inflation actually softened over the QE era. And that seems to be because banks and businesses have used the QE slosh to pay down debt and rebuild their balance sheets. Banks didn’t lend as expected, and businesses didn’t invest and expand output. They just bought back shares and pumped their own share prices. And so the money never made it’s way into the economy. But that money’s still out there. All $4 trillion of it. And it leaves the prospect hanging over our heads that if the transition through banks and business suddenly become a lot more fluid, inflation in the US could really take off. Anyway, it’s good news for the US (at least for now) that the economy is looking strong enough to wind the QE era up. But then just a few days later, almost on cue (almost in a choreographed manoeuvre?) Japan announced that it was massively ramping up it’s own QE program – adding potentially another $180 billion this year. And the same time, Europe is still dragging its heels, but moves closer and closer to QE every day. So far Europe has lagged the other big players (thanks to a reluctant Germany), but with deflation outbreaks in Italy and Spain, it’s only a matter of time. This chart tracks QE in these countries to date – note the massive QE program in the UK. And it shows just how much upside there is to the programs in Europe and Japan. In a way, these countries were waiting to see what the impact of the QE experiment would have on the US before they became too invested. But now that America seems (seems!) to have come through unscathed, they’ll be more willing to pull the trigger. 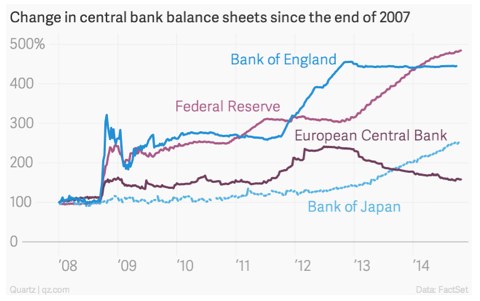 So even though American QE has come to an end, the global money taps remain on. And I say “global” because there’s no such thing as a purely domestic currency. All currencies are global these days. So QE in Japan will impact us here. And what impact will it have? Well, no one knows for sure, but I can give you my two cents worth. Well, I think all the money printing, sooner or later, will massively devalue the currencies taking part. If you’re just pulling dollars out of thin air, then each dollar becomes worth less and less. That’s what inflation is. Each dollar buys less and less stuff. I think we’ve haven’t noticed to date because there are some massive deflationary pressures in play as well. Excess capacity in the developing world, ageing countries, cheap goods coming out China and the developing world, radical advances in technology. All these things are deflationary – they help each dollar go further. So devaluation might not happen overnight, but it will happen. And if a currency collapses, what do you want to do? Well, you want to holding on to something real. That’s why QE sparked a massive bull run in Gold. But it seems that Gold got over-bought, or at least those people waiting for the QE apocalypse to happen got disappointed, and started selling. And so that brings us back to my favourite real asset – real estate. Property is real. It has a defined supply, and it’s always in demand. To me, it’s a very attractive hedge against QE spending sprees. But don’t think I’m the only one who sees this. Why do you think there’s been so much foreign interest in Aussie property lately? The global money taps are on full bore, and all that money is in search of ‘real value’. The more money they print, the higher Aussie property prices will go.